Many of us remember how devastating the 2011 tsunami was to the country of Japan. Not only were buildings swept away and lives lost, but problems with the Fukushima Nuclear Reactor caused the entire population of Namie-machi, a town on the Pacific Ocean in Fukushima Prefecture, to be permanently relocated. Entering Namie-machi remains strictly prohibited, even for the 21,000 people who used to live there. Before you head over to Google to take a look, you may want to brace yourself – a trip through the abandoned town of Namie can be disturbing. In the heart of town, you’ll find abandoned cars gathering rust, smashed windows, collapsing buildings, and overgrown weeds. As you near the ocean, the devastation gets worse – instead of seeing buildings in disrepair, you can only see scattered rubble, washed up boats, and the concrete foundations of where homes and businesses once stood. 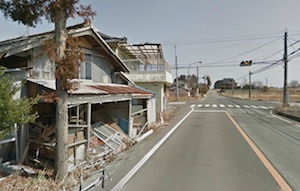 Google Street View gives you almost total access to the town so you can witness the impact of the tsunami as if you were actually there.